Home Off Beat	Scary tattoos for Halloween! If Halloween is scary enough, then Halloween tattoos will scare you all the more. The Halloween tattoos strangely find audience in some people. One of the greatest of them is the macabre tattoos and you can see the simple awesome yet artistic tattoos. The greatest of these tattoos is the portrayal of Vincent Price. Vincent Price was known for his voice more than his face. 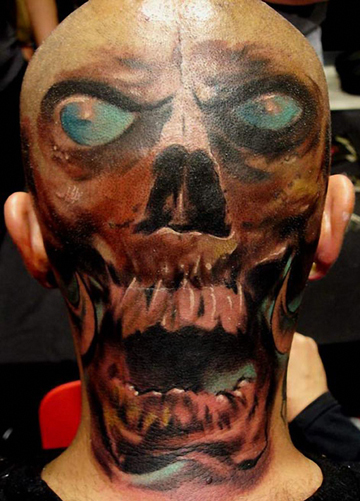 When it comes to such creepy tattoos, gory pieces of art, you would always think of one name- Paul Booth. Paul Booth is from Last rites tattoo in New York. His popularity is so high that people from all over the country and even overseas flock to get their tattoos done by Paul. The waiting list is almost two years now. So, if you are indeed planning to get Paul to do your tattoo, then you must enroll now.